This morning we had coffee in the room and decided to grab and early lunch before heading to typhoon lagoon. 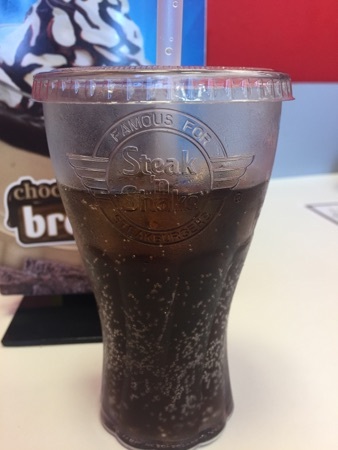 We settled on steak and shake as it's one of our favourites and out that way. 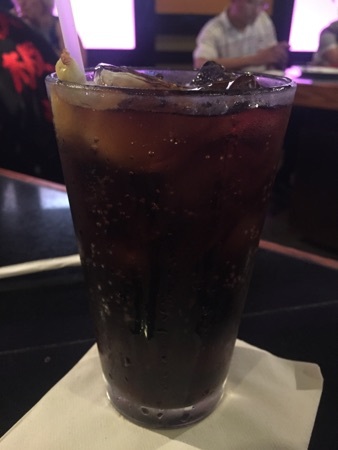 DD ordered a Coke to drink. Kids eat free all day every day which is great. 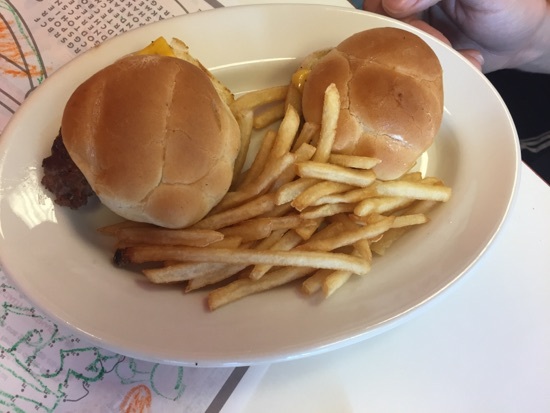 DD had the steakburger minis with fries. These were 2 mini cheeseburgers, it was a decent sized portion to be fair. DH and I both got the garlic steakburger. This is one of my favourite burgers ever! I love garlic and there's plenty here! The burger had garlic butter smothered all over it and the bun has garlic salt sprinkled on top. The result is a very moist and very tasty burger. These are $3.99 each, really good value! 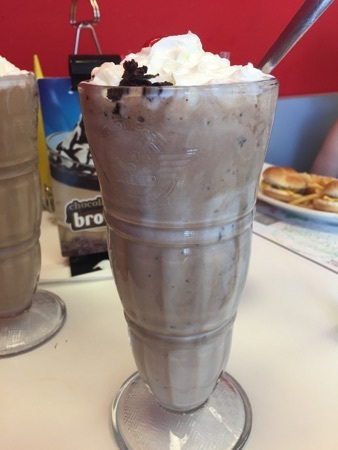 DH had a chocolate fudge brownie shake. These are $3.69 and a meal in themselves! There is loads of brownie in there and you need a spoon to eat some of it! This is my usual shake too but I decided to give something else a try for a change. 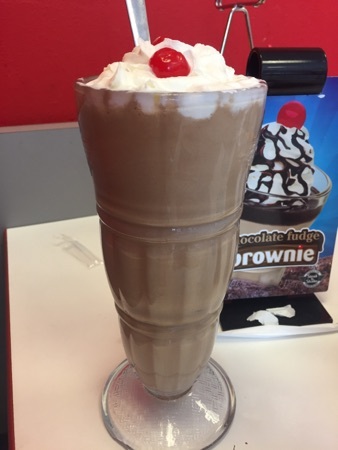 I had a chocolate peanut butter shake. I absolutely love peanut butter flavour so had to try this! It didn't disappoint, it was so yummy! The only thing I prefer about the chocolate fudge brownie shake is it had brownie in it which I like having the bits to eat. Our total came to $21.24, fantastic value! We made our way to typhoon lagoon. It's hot hot hot today! 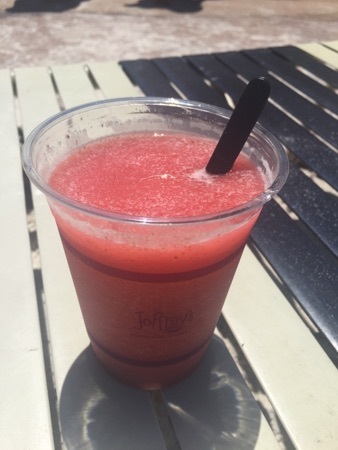 I grabbed a strawberry frozen drink, this is $5.75 including tax. This wasn't as good as the passion fruit drinks, but I felt I had to try one to be sure  I'll stick to passion fruit from now on. We didn't last long at typhoon lagoon and came back to the hotel for a swim in the pool, this meant we were able to make it to Kobe for opening at 5pm. Tuesdays are kids eat free if you sign up to the rewards club, I downloaded the app it was really easy. They also have an early bird menu from 5-6pm. 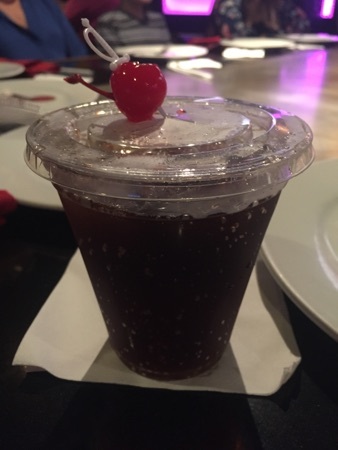 For drinks we all got cokes. 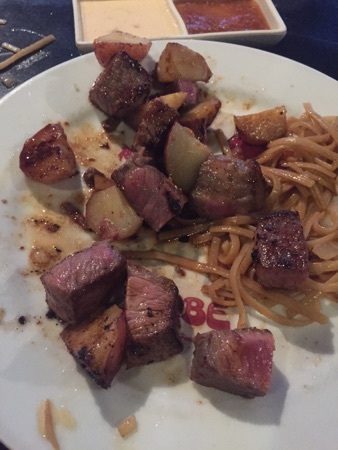 Kobe has a sit down regular restaurant section and a hibachi section. 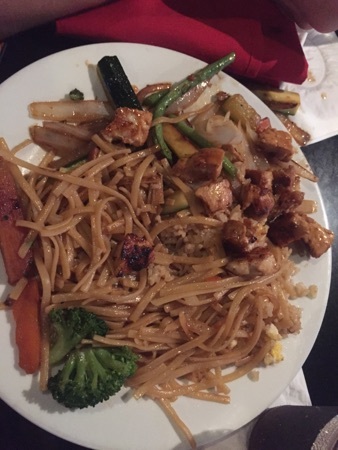 We wanted the hibachi, it's very similar to teppan edo at Epcot. The hibachi menu is sold as 6 courses. 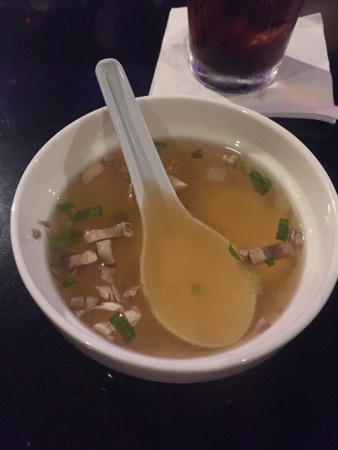 First of all is the onion soup. This is nice, it's quite weak tasting but DD absolutely loves it. Next up is the salad, this comes with a ginger dressing which tastes lovely but has a weird consistency. 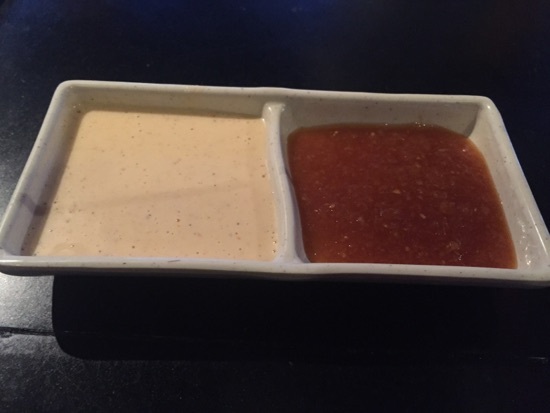 They give you 2 sauces for the meats, white 'yum yum' sauce and ginger sauce. 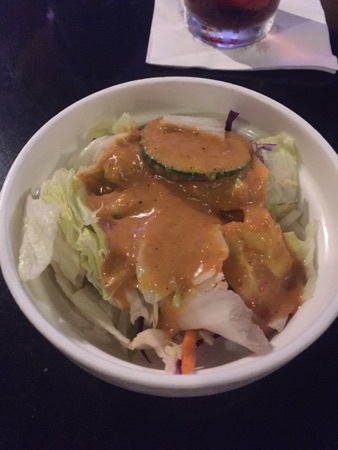 I absolutely love the yum yum sauce, I put it on everything! 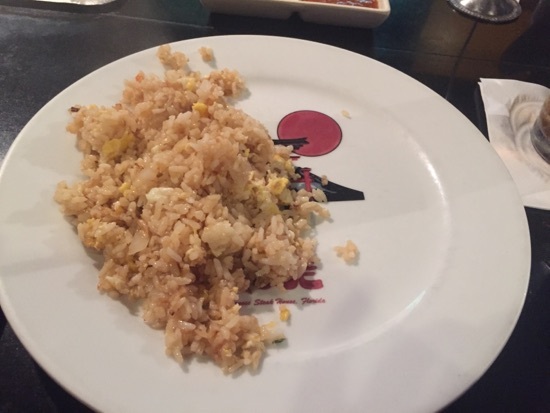 Next the chef cooks the egg fried rice, this was really tasty with plenty of seasoning and a decent sized serving. That is a full sized dinner plate. 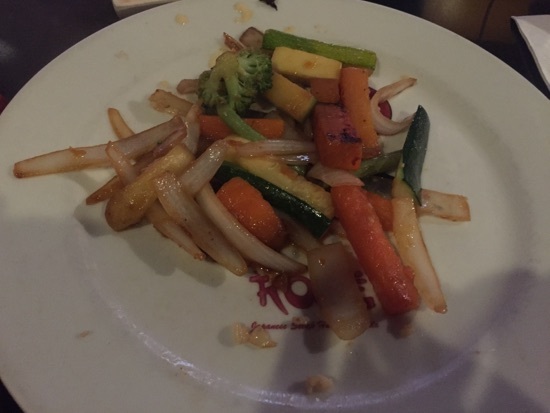 Next up is the veggies, these are cooked in soy sauce and seasoning and were lovely! 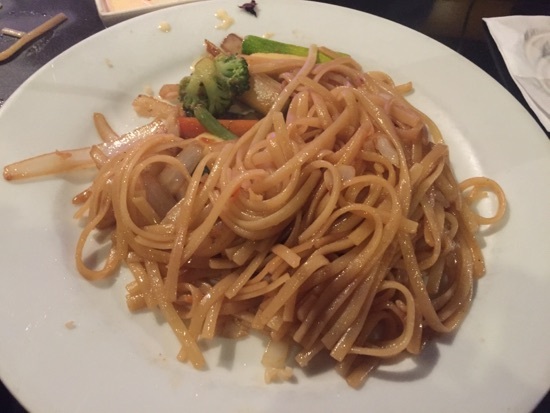 Then the noodles were piled on top. By this point I was getting pretty full. The portion sizes are huge! For meat you have a choice of things like sirloin steak, fillet mignon, chicken, shrimp, salmon or you can have combinations of these. I went for sirloin steak, you got a 6oz serving of the meat/fish. DH went for the steak and shrimp combo and DD had the kids chicken, the kids portion was a 3oz serving. I had my steak medium rare and it was cooked perfectly and was delicious. This is DD's plate with the chicken. She was ploughing through the pile of food best she could. The kids portion is massive! With the kids eat free promo we saved the $9 on the kids meal. 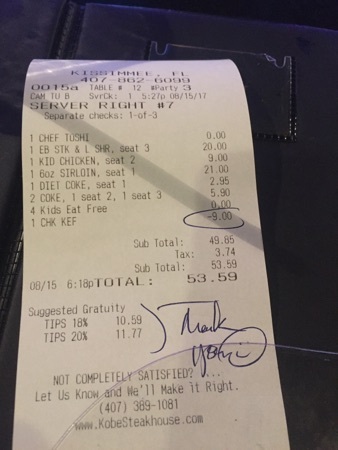 My sirloin was full price to take advantage of kids eat free, couldn't combine the offer with the early bird so my meal was $21 (early bird price is $17), DH's steak and shrimp is usually $26 but early bird it was $20. Overall our meal came to $53.59, it's our most expensive meal so far but we were absolutely stuffed and the food was really good! They offered to box up DD's leftovers to take with us! a bargain too  Thanks for doing your report. New Photo Added by missdopey - 16 Aug 17 3:45 AM. 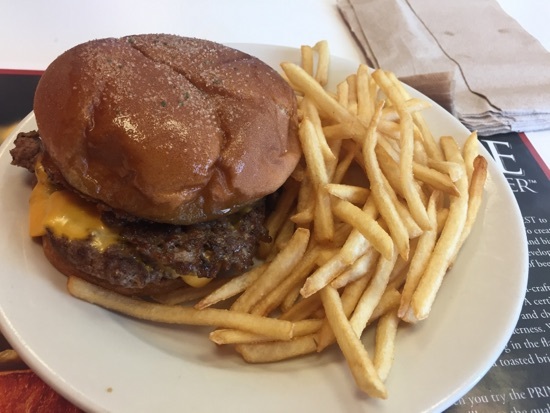 Steak n Shake looks very reasonably priced - your garlic steak burger looks really good. As for dinner - wow what a plateful, definitely worth a visit.